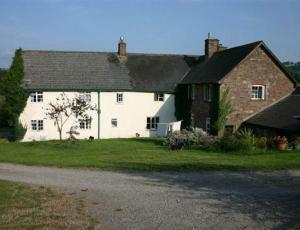 Penydre Farm Bed & Breakfast01873 890246work FarmhouseWarm family run B&B. We are situated on the edge of the picturesque village of Llanfihangel crucorney. Ideal location for seeing the beautiful Breacon Beacons and Wye valley. If you want a quite break or activities holiday it is all available in the area. We pride ourselves on our generous breakfast use local produce when ever possible. Vegetarian and special diet catered for. Breakfast is served in our spacious kitchen usually between 8 & 10.am although this is not rigidly adhered to and consists of: Cereals, fresh fruit salads & juices, yoghurt, sausage, bacon, our own farm eggs, mushrooms, tomatoes etc. We source as much of our food locally as we can. Vegetarian breakfast is available with our own vegetarian sausage. Other diets catered for if possible, tell us what your requirments are, we will always try to help. Warm family run B&B. We are situated on the edge of the picturesque village of Llanfihangel crucorney. Ideal location for seeing the beautiful Breacon Beacons and Wye valley. If you want a quite break or activities holiday it is all available in the area. We pride ourselves on our generous breakfast use local produce when ever possible. Vegetarian and special diet catered for. From Abergavenny follow the A465 in the direction of Hereford; Approximately 5 miles along this road on the left hand side you will see a sign for Llanfihangel Crucorney. Once you have taken this road you will find Penydre the first place on the left hand side. From Abergavenny Train Station you can get to Penydre by Bus. Take the bus to Hereford and ask for the Skirrid Mountain Inn Stop.